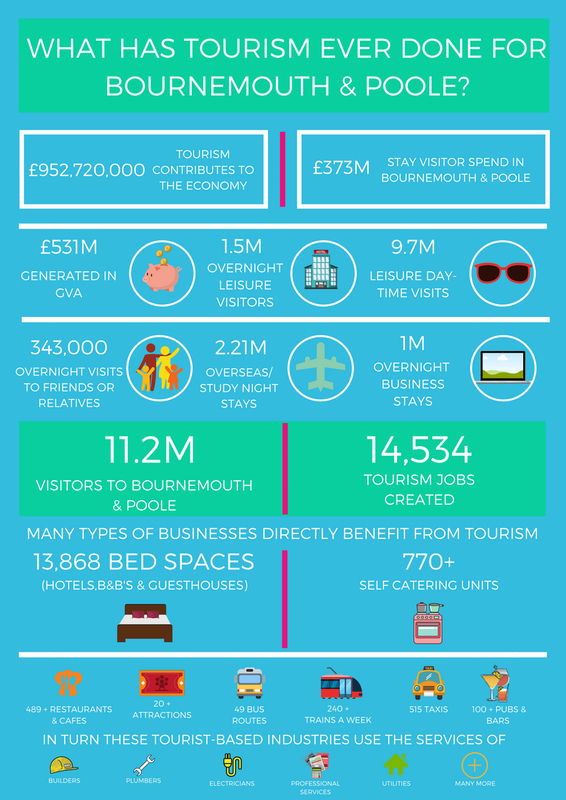 The Bournemouth and Poole Tourism Management Board was set up in October 2017 to embrace and extend the strategic interests of the previous Bournemouth Tourism Management Board and Poole Tourism Management Board. The aim of the Board is to develop and assist delivery of a shared vision for a prosperous tourism industry in Bournemouth & Poole that will enable the residents, businesses and visitors to enjoy the benefits of being in a market leading resort. This aim will be achieved through high level representation of all Tourism sectors, the Councils and other tourism experts, through decisive and wise actions and through clear accountability. Acting as a voice for tourism BPTMB benefits the industry and tourism sectors by providing a strong, unified voice for local, regional and national tourism issues that impact business efficiency. In addition, the Board ensures that the resort’s tourism management, marketing and development activity is both competitive and effective. Managing this performance gives the sector representatives both an active role and responsibility in influencing the business planning, resource allocation and performance monitoring of Bournemouth and Poole Tourism.